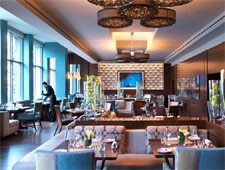 Located on the first floor of the Mandarin Oriental, Boston, this restaurant delivers quality food at moderate prices. : Upon entering the chic Mandarin Oriental, Boston, you may assume the hotel’s restaurant will be over-the-top expensive. But instead you’ll discover the reasonably priced Asana in this high-end location. The interior is decorated in soothing exotic wood floors, limestone walls, sumptuous banquettes and floor-to-ceiling windows that offer a view of bustling Boylston Street. Start with classic steak tartare, complete with capers, shallots and a confit egg yolk served with a crusty baguette. Entrées include Amish chicken, a Berkshire pork chop, Brandt Beef New York strip and oven-roasted blue cod. There’s also a prix-fixe menu available and a private Chef's Table for up to ten diners. Don’t miss the cinnamon donuts served with Mexican chocolate or a scoop of house-made sorbet for dessert. Wine lovers have their choice among more than 300 bottles from around the world.